Marrakesh’s Riad & Spa Laurence Olivier embodies beauty and tranquillity, merging cultural influences from its Arabic Andalusian and Indian Mogul heritages. The riad guarantees privacy, situated in a quiet location just a 10-minute walk from the famous Djemaa El Fna square. The property is also accessible by car. Friendly, helpful staff are on-hand to offer tailored services to their guests. 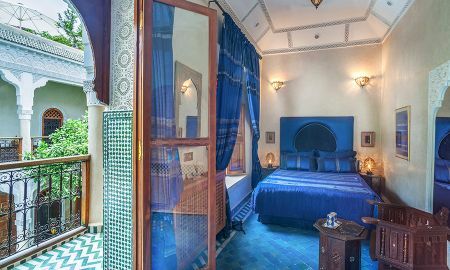 Four guestrooms and two suites are available at the Riad & Spa Laurence Olivier. All rooms are beautifully furnished and decorated to evoke Moroccan culture, with intricate designs by talented local artists. A wide selection of delectable Moroccan and international dishes is available at the riad, served by excellent chefs. Guests will love the riad’s lounge, dining room and library, complete with stunning copper fireplaces. 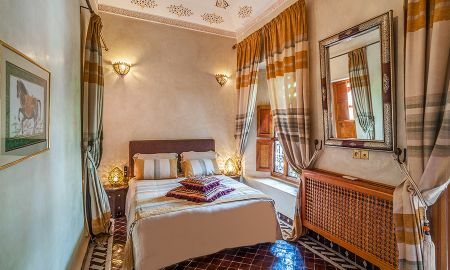 The Riad & Spa Laurence Olivier offers guests delightful facilities including a large swimming pool surrounded by a beautiful garden, a luxury hammam and spa, and a rooftop terrace and garden with stunning city views. 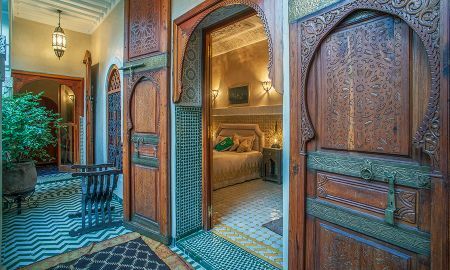 The Riad & Spa Laurence Olivier is situated in Medina, less than a 15-minute walk from the Dar Tiskiwin Museum, Dar Si Said Museum, and Bahia Palace. The Marrakesh Museum and Djemaa El Fna square are less than 2 kilometres from the property. Also within 2 kilometres from the hotel are 3 golf courses; the Royal Golf, Amelkis Golf Course, and Al Maaden Golf Course. Marrakesh Train Station is also only 2 kilometres from the riad.